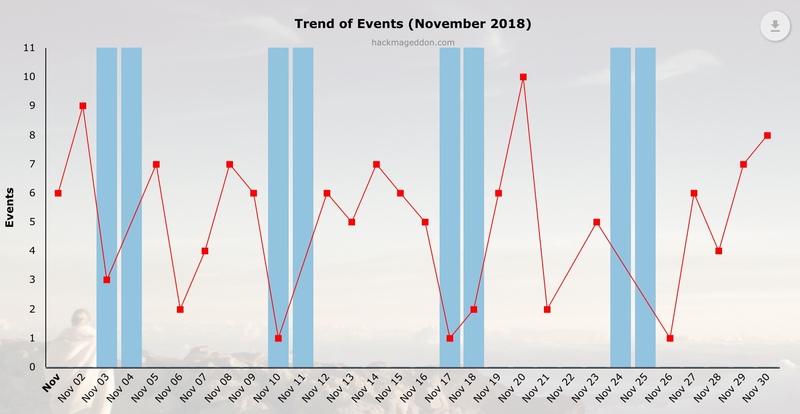 So let’s start with the Daily Trend of Events chart, which shows a sustained and irregular trend, with a peak on November 20, followed by an apparent decrease, and again a tail of activity towards the end of the month. We are used to see Cyber Crime on top of the Motivations Behind Attacks chart, and this is the case for November as well, exceeding the psychological threshold of 80% (82.5%). Cyber Espionage is stable at 12.7% (it was 12.4% in October), while both Hacktivism and Cyber Espionage lose their momentum with respectively 3.2% (vs. 5.3% in October), and a tiny 1.6% (vs. 4.4% in October). As always, Malware is stable on top of the Attack Vectors chart with 31% (it was 28.3% in October). Account hijackings rank at number two with 19.8% (vs. 12.4% in October) ahead of targeted attacks with 12.7% (it was 14.2% in October). Unknown attack vectors rank at number four. Crooks decided to diversify their business in November, so attacks targeting multiple targets rank on top of the Distribution of Targets chart with 23.0% (up from 19.8% of October), ahead of single individuals and human health, respectively with 19% and 11.9%).